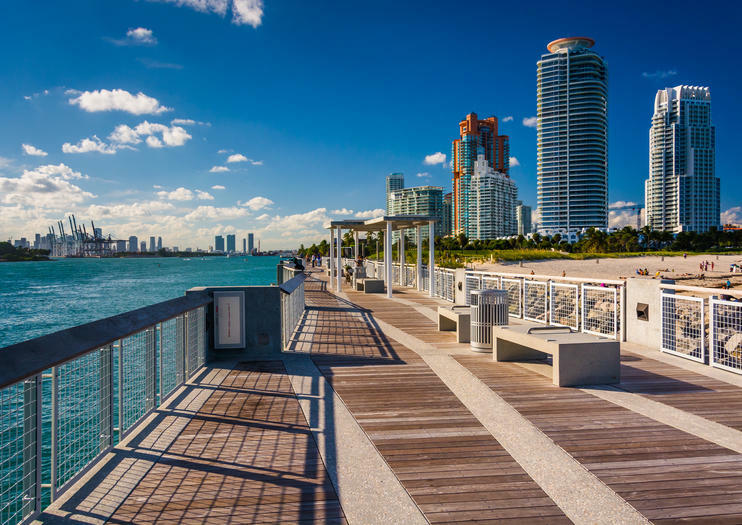 The 17-acre South Pointe Park, also known locally as just South Pointe, offers expansive views of popular sights like Downtown Miami, Fisher Island and Biscayne Bay, all the way out to the Atlantic. Originally used in the early 1980s to house a police unit, horse stables and the Port of Miami’s Harbor Pilots, the area has undergone major changes since then. Now a thriving park, the site includes 20-foot wide walkways lined with Florida Limestone and an ocean-themed playground area for children. There are numerous amenities, including a restaurant and a separate dog park, and at night, the promenade is lit up by neon light towers that provide stylish functionality. Watch for cruise ships sailing past and check out the park’s contemporary art sculptures. The beautifully maintained grounds have become a popular spot for film crews and photo shoots, so keep watch for any celebrity sightings. South Pointe is the southernmost point of Miami’s South Beach area and borders Government Cut to the south and Port of Miami to the east-northeast. South Pointe Park closes at 10pm daily, but the walkway remains open until 2am. If you plan to fish off the pier, be sure to familiarize yourself with the local regulations and rules. Why walk or bike when you can glide through the streets of South Beach Miami on a Segway. Your guide leads you through the historic Art Deco District, and your easy-to-ride Segway makes it possible to cover a lot of distance with ease. See South Pointe Pier and Park, the South Beach Marina, and the Versace Mansion. Plus, choose from multiple departures to easily fit this tour into your schedule. Taste your way through Miami’s Latin and Caribbean cuisine on a small-group South Beach food tour. With a series of five included food and drink tastings, this foodie walking tour goes beyond tourist restaurants to explore authentic flavors that many visitors miss. Try a classic Cuban sandwich, nibble award-winning Key lime pie, and taste Miami-style fried chicken, all while soaking up the lively atmosphere of a historic beach-side neighborhood. Flytographer 60 Minute Vacation PhotoshootConnect with a local professional photographer in Miami and capture your most memorable moments during this private photoshoot. Get insider tips on the best things to do in Miami, including where to eat and what to see from your vacation photographer. Return from your trip with beautiful, high-quality, vacation photos.The best souvenir ever. Flytographer 30 Minute Vacation PhotoshootConnect with a local professional photographer in Miami and capture your most memorable moments during this private photoshoot. Get insider tips on the best things to do in Miami, including where to eat and what to see from your vacation photographer. Return from your trip with beautiful, high-quality, vacation photos.The best souvenir ever. Miami has a strong rollerblading community and is a great place to practice the sport. Rent a pair for yourself and explore South Beach on your own. Cruise past landmarks like the Delano, Fountainbleu, and Nikki Beach Club, or just enjoy the fresh air and exercise. Rentals are available for one or more hours, and the rental office can provide tips of specific places to do on your excursion. Flytographer 90 Minute Vacation PhotoshootConnect with a local professional photographer in Miami and capture your most memorable moments during this private photoshoot. Get insider tips on the best things to do in Miami, including where to eat and what to see from your vacation photographer. Return from your trip with beautiful, high-quality, vacation photos.The best souvenir ever. Flytographer 120 Minute Vacation PhotoshootConnect with a local professional photographer in Miami and capture your most memorable moments during this private photoshoot. Get insider tips on the best things to do in Miami, including where to eat and what to see from your vacation photographer. Return from your trip with beautiful, high-quality, vacation photos.The best souvenir ever.